There are a lot of things to love in this piece from Christie Aschwanden about why retractions, studies that don’t hold up to reproduction, and even sub-fraudulent “p-hacking” do not mean that science is broken, but it is, simply, very hard. Among those things are the great visuals from Ritchie King – including a fun “p-hacking” demonstration tool. It’s supposed to be hard. If it wasn’t hard, everyone would do it. The hard… is what makes it great. Contrary to the rhetoric that would portray “science is hard” as an endorsement of success over a monumentally difficult task, this is not the point. As Ashwanden addresses, science is hard because it is messy and complicated and requires a communal effort from members of a species that is only dubiously social outside of relatively narrow local groups. If we’re going to rely on science as a means for reaching the truth — and it’s still the best tool we have — it’s important that we understand and respect just how difficult it is to get a rigorous result. There are things like sampling variance and mistakes and uncontrollable environmental variables and resource limits and the fabled “orthologous methods” that inject all sorts of inconsistency and challenges into the textbook scientific method. This is why the great philosophers of science* spoke about disproof rather than proof, about independent reproducibility, about probability rather than certainty. These issues do not indicate that science is broken. There simply is no other way it could work in the hands of mere humans. What may be broken is the way we perceive science. We need to understand that it is a gradual and a community effort. We need to understand that our mythos of science – of the great, usually in the stories, man performing a great experiment and making a great discovery – are almost always false summaries which are convenient and inspiring, but do not represent why science is truly hard. *It is also why those who dismiss the philosophy of science as a waste of time – I’m looking at you Neil DeGrasse Tyson – deserve nothing but the most vigorous of side-eyes on that point. Organizations that fund scientific research love to call for paradigm-shifting proposals. And scientists love to think that their latest work is smashing down staid, old paradigms. 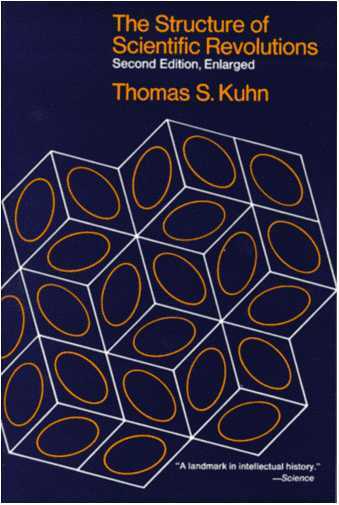 But this focus on paradigm shifting gets Thomas Kuhn exactly backwards. If you want a paradigm shift, don’t go looking for it. That’s Kuhn’s major point in this week’s The Structure of Scientific Revolutions reading. Last week, we had a broad discussion of Kuhn’s ideas about pre-paradigm science, what a paradigm is, and why normal science is like solving puzzles. This week we’re going to be a little more focused: we’re going to talk about four pages – p. 62-65 – instead of four chapters. Welcome to the first meeting of The Finch and Pea’s The Structure of Scientific Revolutions 50th anniversary bull session book club. Grab a drink, pull up a chair, and let’s talk about the first four chapters of that book you always meant to read. I will admit that I’m a sucker for book anniversaries of any sort, and since this month marks the 50th anniversary of the publication of The Structure of Scientific Revolutions, here’s your excuse to finally read it. I’ve been looking for an excuse to re-read it, since the first go around apparently made no impression on my brain – I will admit that I can’t say a single, intelligent thing about it. To get yourself jazzed up, you can read the appreciation in The Guardian, and you can buy yourself the swanky new 50th anniversary edition. As for me, I’m sticking with my less glitzy second edition with the cool, somewhat minimalist cover. Why are so many non-reproducible experiments so highly cited? Part of the problem may be a growing cultural change in biology: not everyone does experiments now. More and more, biologists are divided into experimentalists and computational biologists. (I hesitate to say theorists, because computational biologists don’t theorize about biology any more than experimental biologists.) The reason for this division is because, thanks to the growing availability of big data sets, it is possible to learn something new by analyzing already available data.